The first winner on quarter-finals day in Charleston was Daria Kasatkina who produced one of the best performances of her season so far to defeat Irina-Camelia Begu for the third time in 2017, 6-4 6-1. Kasatkina is into her first semi-final of 2017 and played a very positive match. Taking on board the words of her coach, Kasatkina kept Begu on the move and was aggressive for most of the match – her heavy forehand was on song and lethal on this surface! I’m thrilled to see Kasatkina’s confidence on the rise. Interesting to hear from Kasatkina about trying to be more aggressive. I wrote in my last post about her coach always saying in their changeover chats about being too passive. Laura Siegemund continued her fabulous week with a 6-2 6-4 victory over Anastasija Sevastova. Aside from a passive spell at the start of the second set when Sevastova went up 3-0 with a double break, Siegemund was all over this match. The German player was aggressive, decisive and dynamic, hitting more devilishly good drop shots. Siegemund finished the match with a gorgeous pass – she was generally given a helping hand at the end by Sevastova who played a listless final game. One very happy Laura Siegemund. Kasatkina and Siegemund will play each other in the first of the semi-finals and that’s an enticing match! Kasatkina leads the head-to-head, 3-0 and won their last match in St. Petersburg in 2016. Siegemund is at her dynamic best on the clay and i’m intrigued to see whether her energy and intensity will cause Kasatkina to go into her shell. I think that Kasatkina will be more consistent than Sevastova. There’s a lot on the line for Dasha as she’s never made a WTA final before but she’s been building confidence match-by-match. Going for Dasha in 3. Earlier in the week Shelby Rogers scored a double breadstick comeback win over Madison Keys. On Friday, she was on the receiving end of one as Mirjana Lucic Baroni came back to win, 6-7(7) 6-1 6-1. Rogers had nicked the closest of opening sets you could imagine – there were few patterns in play with both players absolutely belting their returns. Both players saved set points in the first set tiebreak with smashing returns but it was Rogers who found some peak tennis to take it. Lucic-Baroni showed terrific staying power to come back in the second and third sets and reach her third semi-final of 2017. Heads up for a super interview with Lucic-Baroni on The Body Serve podcast. And well done Shelby on a great week! In the final quarter-final of the day, Jelena Ostapenko hit 40 winners (!) to beat Caroline Wozniacki, 6-2 6-4 and claim her first top 20 win since Birmingham last year. Sooo… the second of the semi-finals will be experience against youth as Mirjana Lucic-Baroni takes on Jelena Ostapenko. The pair have similar games though and Ostapenko won their only previous match in Auckland earlier this year, 6-2 7-6(3). I haven’t seen a great deal of Ostapenko this week which is probably why i’m leaning towards Lucic-Baroni. The Croatian player is exuding confidence on the court and to come back from such a tough first set loss against Rogers was very impressive. Peak Ostapenko is a thing and her confidence is clearly rising, but Lucic-Baroni is one hell of a fighter. This one will likely come down to who gets the first strike in and who serves better. 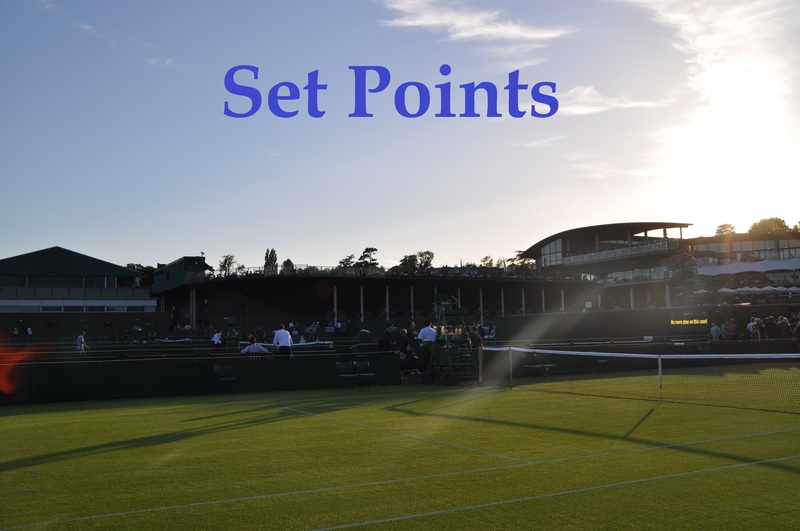 April 8, 2017 in Charleston, Set Points, WTA. I’d love to see Lucic Baroni and Kasatkina win. That’s the final i’d like to see. How’s Monterrey for consistency? The four top seeds are the last four standing. Rare! Good to see Carla back. Looking forward to the Kerber v CSN match in Monterrey, tossup. That’s *if* Kvitova and Azarenka are able to return to good form. Having a baby changes the body a great deal. At her age, I think it’s unlikely she’ll be able to regain the same fitness. Then you consider the amount and frequency she’s had injuries over the past 5 years. Then with Kvitova… who knows if she’ll really recover from such a terrible attack. I also happen to think that Sharapova’s best days are undoubtedly behind her. Even before the ban, her results were mixed. Girls really aren’t intimidated by her anymore. And her style of play has become completely one dimensional. In today’s game you really can’t just camp out on the baseline for the entire match. I agree but this is Azarenka. The same can be said about Klijsters after she came back from giving birth and she played better than ever. She won 3 grand slams and the WTA Finals aswell. Azarenka will only be 28 which is still young in the women’s game. You have 5 of the current Top 10 that are older than her and in terms of challenging the best, it could be said that Azarenka is the only one that challenges Serena consistently. Yes, it will take a while but look at how she returned last year winning the Sunshine Double and she almost bet everyone in the current Top 10 to do so. However it will take time as I said. Clijsters was several years younger than Vika and came back during a weak period. She was also physically in much better shape than Vika ever has been.